Boston Cream Pie is one of those desserts that is not what people think it is. Pie? Uhm…not really. Cake? With gooey stuffs and chocolate icing? Oh yeah! These are easy, yummy and mostly bite-sized. What’s not to love? 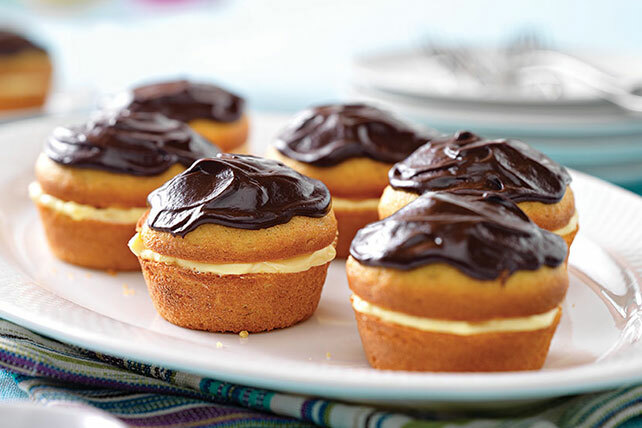 Learn how to make these delightful Boston Cream Pie Minis! Fill the cupcakes with vanilla, and then top them with chocolate for the perfect finishing touch! Beat pudding mix and milk in medium bowl with whisk 2 min. Let stand 5 min. Meanwhile, use serrated knife to cut cupcakes horizontally in half. Microwave remaining COOL WHIP and chocolate in small microwaveable bowl on HIGH 1-1/2 min. or until chocolate is almost melted, stirring after 1 min. Stir until chocolate is completely melted and mixture is well blended. Let stand 15 min. Frost cupcakes with chocolate mixture. Refrigerate 15 min. This entry was posted in Writing Life and tagged food, Nightriders MC, recipe, Tuesday Treats, WIPs, writing. Bookmark the permalink. Hubs is more the custard lover here. Maybe I’ll think about making these for him sometime. Thanks! I was just thinking the same thing – buy the plain cupcakes and go from there. How quick and easy it would be and I think they’ll be a hit at all picnics :).